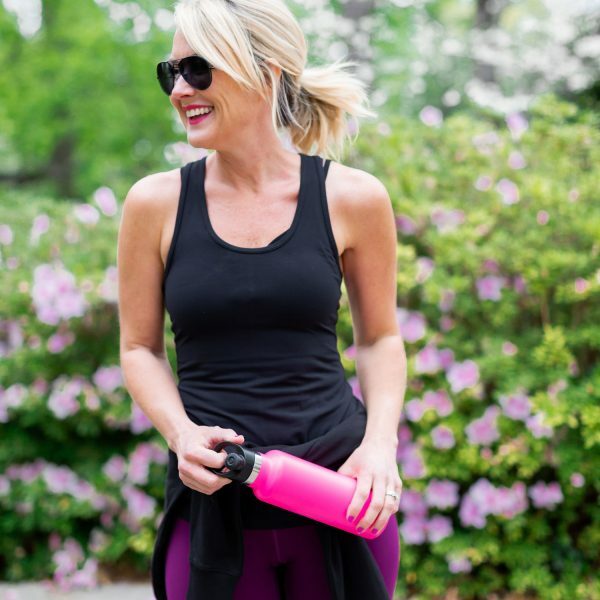 Now & Later | Fall Transitional Style | hi Sugarplum! Thanks for the love on yesterday’s post of family pics! This blog also serves as our own digital scrapbook, so thank you for indulging me! It’s crazy to look back over the years at how much the kids have grown and changed. I fall down the rabbit hole of my own blog looking at the kids sometimes! We had a hefty dose of Fall weather on our trip through Ireland and Scotland, so I’ve already pulled out favorite boots and jackets. But Texas has barely started cooling down, so it’s back to that tricky season when the calendar says Fall, but the weather says Summer. 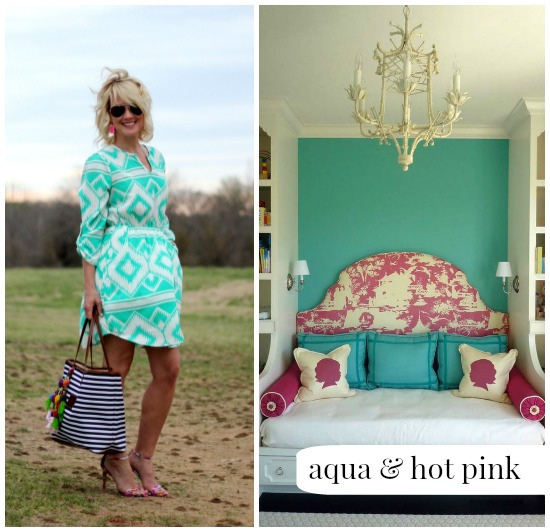 Today I’m sharing a simple look that easily transitions from now to later. And it’s all super affordable! 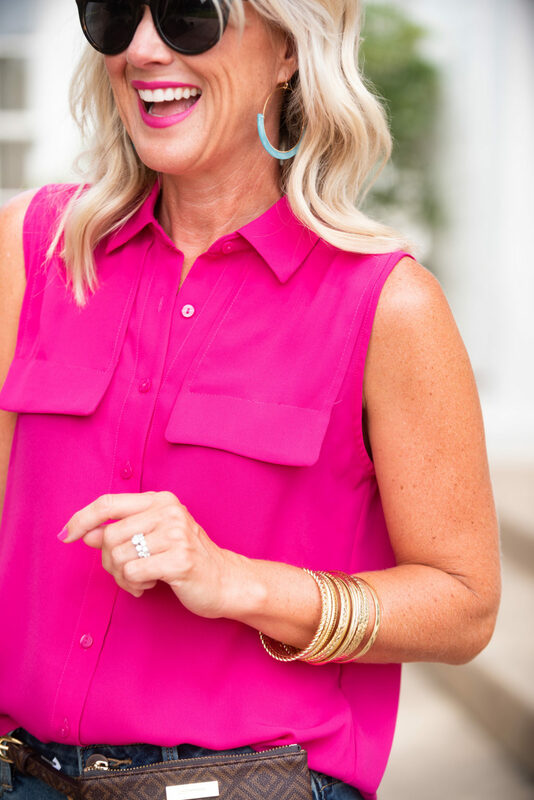 This classic blouse is lightweight and comes in a ton of colors. 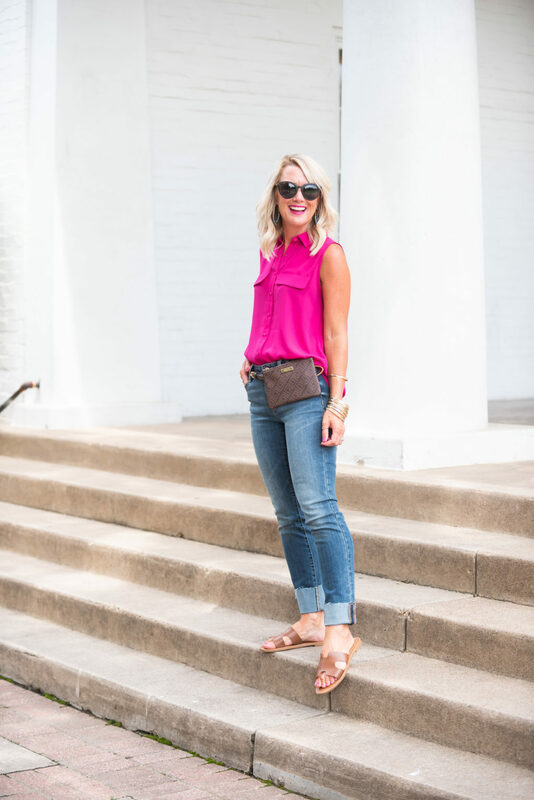 It’s perfect for work with a skirt or slacks, but tucks into jeans for a casual look, as well. 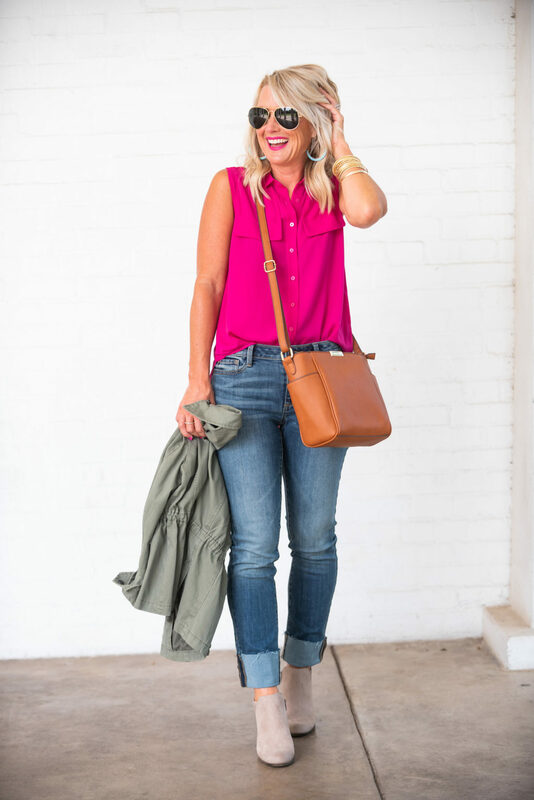 The combo is the perfect mix of Summer and Fall, and fits the in-between season well. 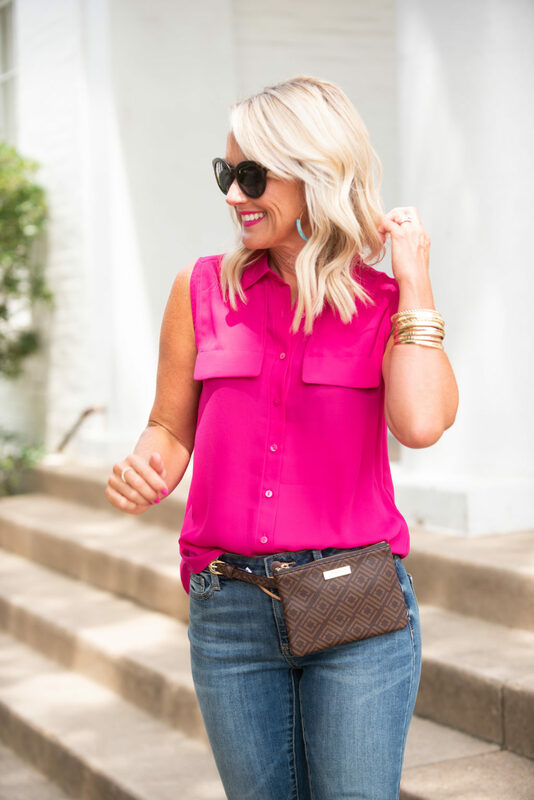 I found this belt bag for under $10 and thought it would be a fun change from my usual tote or crossbody. It’s big enough for a phone and lipstick, so it’s great for travel. What do you think? 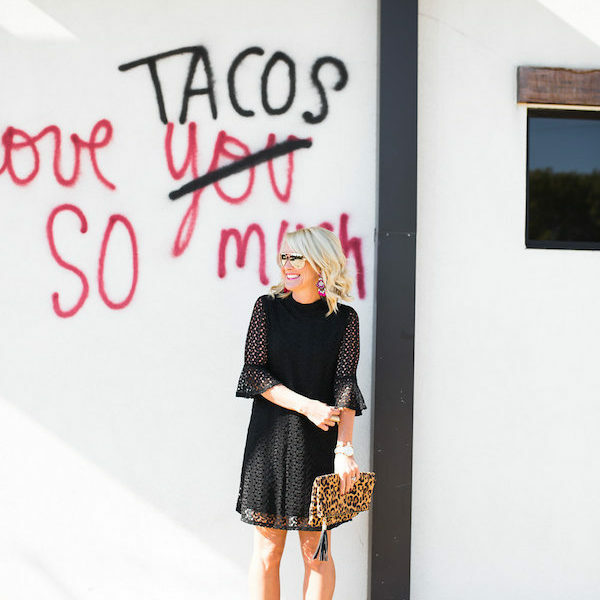 Is it a trend you can get behind? 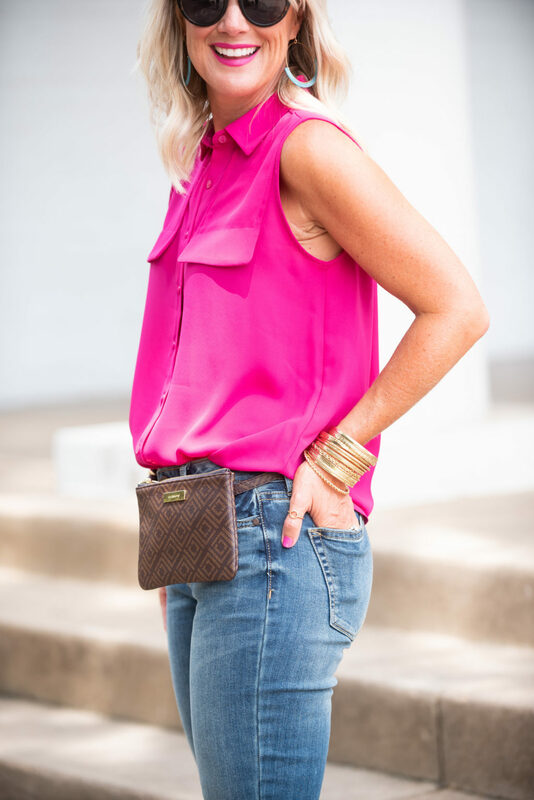 This slim style has certainly come a long way from the old fanny packs! 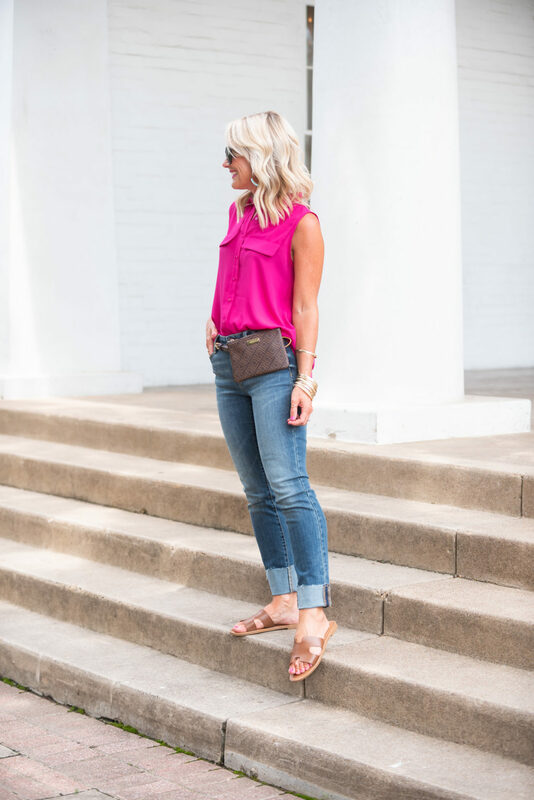 Fit Tip: I’m wearing an XS petite blouse, and size 2 jeans. When it finally starts to cool off, I’ll swap the sandals for boots and add a light jacket. 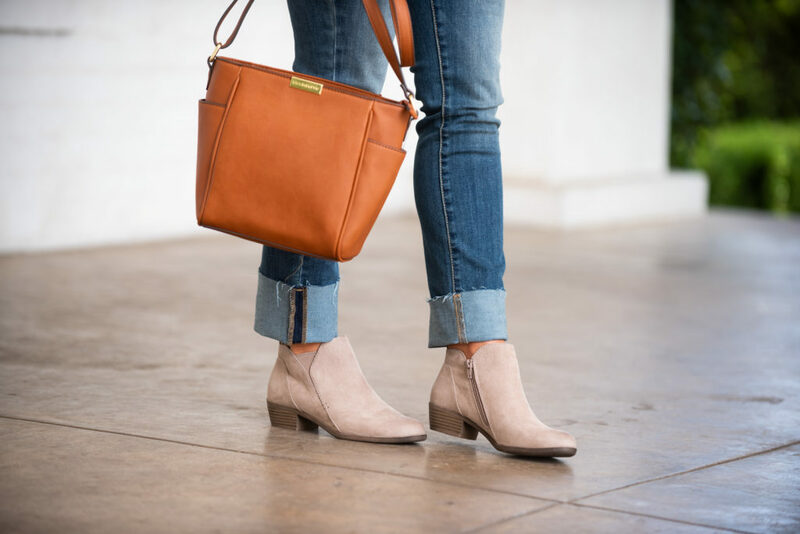 These booties are super comfortable, and the light taupe a great neutral for pairing with both brown and black. And on sale for under $30! Fit Tip: They run large, size down half. 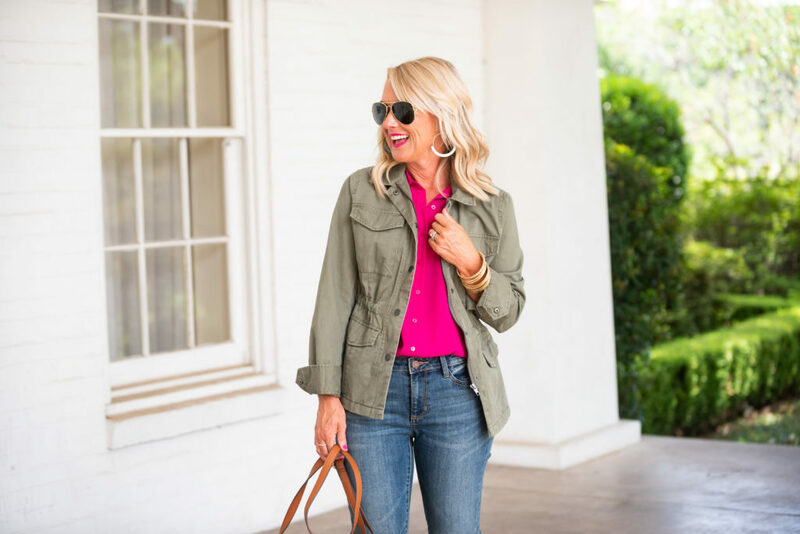 You know I love a utility jacket, and this olive shade goes with virtually everything. It also comes in black and sand, and a fun camo. Can you believe everything I’m wearing is from JCPenney? And it’s all up to 60% off with code GOSHOP25! 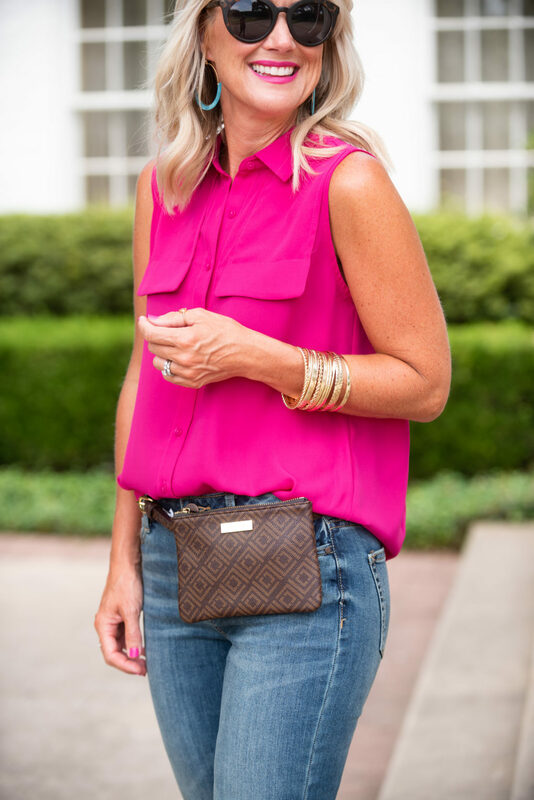 So many great Fall finds and crazy-good prices! What’s your formula for transitioning to Fall? 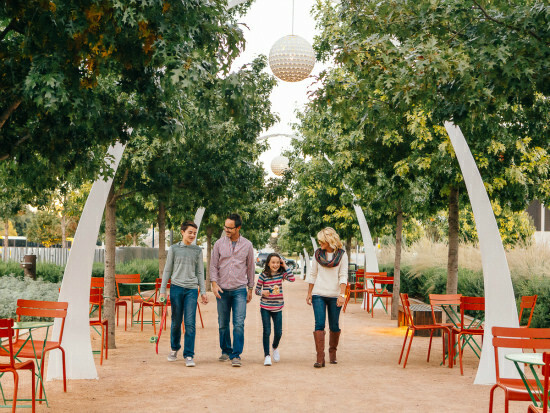 Do you want to see more Fall transition styles here? Here’s 15 Ways to Wear a Military Jacket for more inspiration. And all my Fall styles can be found here. Same here, great look. Luv the matching lipstick & blouse idea! 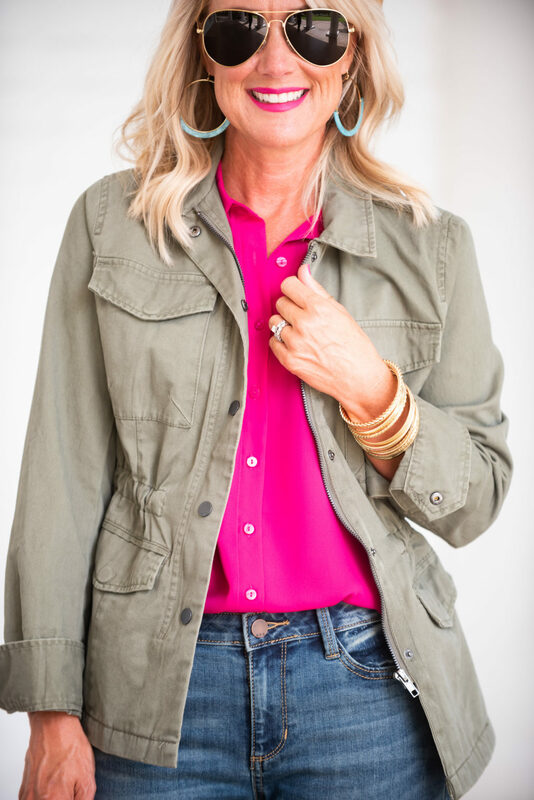 When you layer the utility jacket over it, fantastic! OH WOW!!! Every time I see one of your outfits, all I can think to myself is where ‘she’s getting ideas. Your style is everything. 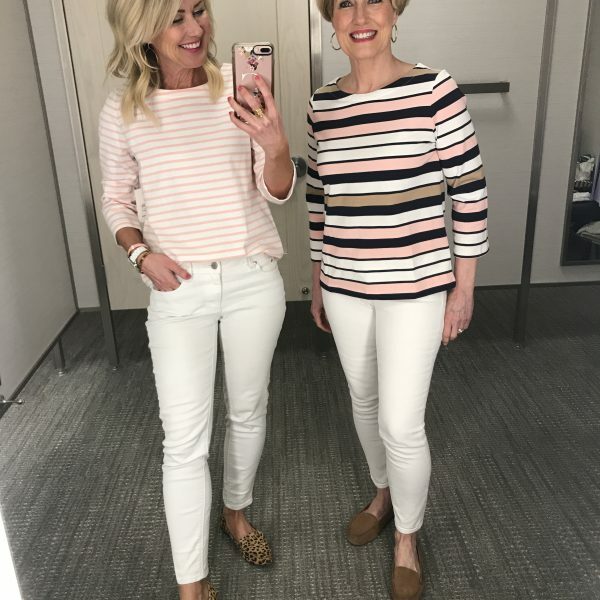 Unfortunately for JCP, the cute, sleeveless shirt shown appears to be out in EVERY size of every color… except the blush, which is ONLY available in Petite XL or XXL petite on 9/11 at 1 pm. I think this post went live in the early hours just today. The shirt is darling. 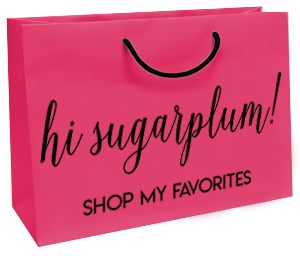 It is too bad for the retailer it is mostly unavailable to Hi Sugarplum’s many readers. Perhaps JCP will restock. I will look back. Fun picks Cassie!